I haven't done much with this blog for a while. Partly because I'll be leaving my role at the David Ross Education Trust in January 2019 and wanted a fresh start online. This short piece is aimed at school Office 365 Admins. I had played with Stream before and enabled it for a few users on our system, but it went live this week properly. Having logged back in and broadly liked what I found I filed it under "look at weekend." One thing that did concern me is that by default it is intended for user-level publishing and sharing and commenting. Just now logged in as a test account I realised Stream was enabled for ALL USERS on our systems. It is entirely possible this is my mistake from when I was trialling it, but I think not, I think it has been simply launched and enabled for all. I don't suggest trying to go into Azure Active Directory to disable it, simply making two small changes to render it safe while you may be planning to roll it out with appropriate levels of access. There you can make two important changes from the default. You can set up a limited number of admin accounts for Stream. You can prevent users from leaving comments on videos. You can list the people that can make new channels and upload video. If like me, you plan to use Stream as a much-improved version of 365 Video, then you will want to have only the people you want as channel publishers listed there. To be clear, I'm surprised at what happened, not blaming anyone - I think Stream looks brilliant and I'm looking forward to properly trying it as we get ready to move a lot of channels across very soon (I hope we'll have all our video in Stream for the new school year) - but the risk of the system being left unmanaged and users discovering it, making channels and publishing any video they like seems to me to be way too high risk. As I'll blog later - Microsoft seem to be putting social interaction front and centre of their educational offer (I find some elements of Teams for Education troubling), which strongly differentiates them from Google, where content and permissions underpin everything and limiting the ability of students to comment around work is baked in and easy to do. Nothing wrong with looking for students to interact as a group around learning - but I'd prefer the default position to be off not on so that it is only when it is desired and will be managed that it takes place. The extra "muscle" of the Acer really counted when I used appear.in for video conferencing and wanted to keep quite a few other tabs open. On the HP it was OK, on the Acer it was seamless. Although I prefer the camera in the wrist rest, when I started using them to take photos I found I wanted to take them portrait not landscape, and in that case the Acer camera position is just as good as the HP one. My son thought the Acer looked cooler. I prefer the HP but he has generally got better taste! I did not get on well with either in flipped mode. In particular on the HP in Google Docs, for some reason I used a pinch to zoom to see a document better and that messed up my ability to click with the trackpad into a location to edit, I had to use the stylus or my finger. After a couple of times this drove me to distraction. As a test I did the same thing on the Acer and didn't have the same glitch. Don't think that proves anything about either device, but it does underline that some areas around the use of Keep, the touchscreen and the stylus are not as polished as I'd expect them to be. I'm fortunate to have an Acer Flip 11 and and HP x360 Chromebook to try out this week to evaluate. This blog posts sets out my thoughts on how useful they may (or may not) be from my perspective as someone who buys quite a few Chromebooks from a number of suppliers for different roles - but hopefully if you're buying just one for yourself there will be something of interest here. To get the straightforward out of the way first. I don't have definite pricing on either of these to compare with a standard Chromebook but I think I can say when and if I'd choose to get one. These are both pretty good little laptops for anyone that generally lives on the web (I'll get to Android in a second). If you have ever used a Chromebook you'll find both of these very nice to use and very similar, but better to what came before. Both are made of "nice plastic," both have good enough keyboards and trackpads and very nice screens and both have very long battery life. They also appear to have more memory and "fizz" than older models and handle many many tabs in Chrome open at once. They will both run Android apps. I can't test it on these but I saw it done last week on the Acer and it was seamless and slick - for a school I have some reservations about Android apps, but for a personal laptop that opens up a lot of possibilities. They both flip. You can effortlessly bend the screen back on itself and make the Chromebook into a "tent" or a tablet. You can buy a pen to go with them and I tried it with Keep and it worked really nicely - fluid and responsive. There is a glitch in the way Keep works in portrait that would drive me insane if this was my own laptop and I cannot believe this is actually on sale in the state its in.... I would say though that both are a little heftier than an iPad, so if you think you'll be cavorting around a classroom with one, you'll probably want to hold it two handed and take your time. For me that's a really important use-case. A lot of our staff use expensive iPads as companion devices for work, and taking photos of student's work for later review or sharing is a very important function. Both these devices have a nice rear-facing camera with good resolution and a neat little app - so I can happily use this device as a slightly heavier replacement for the iPad, that I can later fold back to laptop form factor. A niggle though.... on my iPad I can open the Google Drive app and directly photograph into a folder on my Drive from the device - so as I wander my class the images of work can be appearing immediately on the big screen. It is not possible to directly take photos into Google Drive from the Camera App. A teacher would have to take the photos, run the Files app and upload. Maybe the Android version of Drive will fix that? So all round good - two tweaks to software needed but the hardware fine. If I were buying a Chromebook for myself and these were within my budget I'd definitely go with this rather than the old models. If I were buying a class set.... well, read on. The Acer has its camera in the hinge, the HP in the palmrest. I definitely prefer the HP in this regard. Both are made of good plastics but the HP actually manages to feel quite premium... bizarrely I hated the construction of the Windows version of this laptop but this is much nicer. The Acer has stickers. Three stickers. Gah. My guess is the HP will be more expensive and in truth if you want to save a little the Acer is great. With my own money I'd buy the HP. So far so good. Most Chromebooks get bought by schools. If you were buying a few hundred the price increase on these will add up to a lot of money. Here are some thoughts on how they'd stack up. Almost all of the Chromebooks we buy are for set of devices that get shared over the course of a week by many students. They are workhorse devices - sometimes used for a whole lesson, sometimes dipped into for a few minutes. We expect to get many year's use out of a device and to have minimal support issues with them. The one big win for these devices is they use USB C for power and have it on both sides of the case, so on a laptop trolley you can put them in either side and I assume they aren't too fussy about which charger is used on them (probably fair to say not all USB power adaptors are created equal but I have been happily using either adaptor with either laptop without issues). I can see the next version of the entry level non-touch Chromebooks having the same ports as these - or at least USB C - that will be a definite choice. But none of the other stuff really makes me thing it is worth considering either of these devices in this role - even worse, Android apps look to be a disaster for this kind of shared use, we're back to exactly the same bloatware download for every user slowing down the system that we moved to Chromebooks to escape. USB C and A ports on either side really useful - hope to see lower end models get this too. So there is no way I would buy either of these laptops for shared classroom use. We don't currently buy shared devices for staff but if we did, the more premium nature of these might be something to consider. The dreaded 1:1. I am not a fan of 1:1 as a practical approach as frankly it always seems to end in a finance agreement for parents to pay for the laptop (in which case, as a parent I'd rather choose what I bought for my child...) but there are schools that are, and there are use-cases for our academies where 1:1 makes perfect sense - for example we have several that issue a Chromebook to a new 6th Former to use throughout their studies. In that situation the add-ons in these devices compared to the bog standard Chromebook might be compelling. They feel nicer and will certainly be better received. They have the camera which will get some use. They are faster and I think the keyboard and trackpad will be better. I think the whole flippety thing is a red-herring - without the pen it's a novelty and the pen isn't so well evolved yet as to make it compelling. Android apps make good sense in this kind of situation - it is possible to "bless" certain apps as being available at your school - or even to mandate every device has them, and I can see that being useful. This year, I think I'd stick with the better "non-flippety" Chromebooks most likely unless the price difference is very small but it is a very close call and we shall see how the pricing compares. We've been moving away from the Windows laptop as the main device for staff slowly for a while now - some academies in particular are having a lot of success with a good desktop PC in every classroom and where necessary an iPad as the teacher's personal device to communicate, screencast to the big screen and run specific apps (like SIMS): indeed that is the basis for our Star Classroom setup. Could these flippy Chromebooks take over that role in a world where the room had a PC already in place and the teacher needed something for creating content anywhere, accessing SIMS, grabbing photos of student's work and screencasting? Minor weight issues aside, assuming Android apps work as well as the demonstrations, and that the price per unit is less than the new iPad plus annual MDM costs (I would never use iPads without some kind of management system like Casper) I think this is a really interesting device. I think this year, after some trials that is the kind of initial use we may see these new Chromebooks filling that role as the cheaper ones gradually take on the features of this generation. As a device for me? It's not long ago that I felt the pain of getting a Pixel - one of the first generation - and for a good while it was my main laptop and I can honestly say I could do everything in ChromeOS I do now. The issue with it was heat and battery life - after a year it could barely manage 2 hours away from the plug, so I went with a MacBook not because of MacOS (which I do love but I can happily live without) but because it was (at the time) the ideal hardware for me - light, great screen, great trackpad and huge battery life. Already, after using the HP in particular to do some routine work, I could see myself using this as a main day to day laptop - and I certainly wouldn't feel bad asking any colleague to do the same (if they are Microsoft Office users I'd probably want to check that the Android Office apps works as smoothly as I'd expect - but I have no reason to think they wouldn't). I'd probably try the stylus and maybe use it a fair bit, but I don't see anything quite like the sophistication of Windows 10 ink here - enough for me to use from time to time, but not enough to change the way I work away from QWERTY to pen. I seem to be damning with faint praise in all the above, so I'll try and end with a little balance. These are revolutionary devices - truly a huge step up. The best Chromebooks you can get. It looks to me that as a device for a teacher, the Chromebook is ready to supplant the iPad or Windows PC (or often, both). That's a tough call to make (and a huge step, because an error in that kind of choice will affect a lot of people very badly). I certainly would not want a cut down Windows 10S device instead of one of these. Within Android apps like SIMS Teacher and the Microsoft Office ones they are great. Same for a student who has a device all day every day. The niggle for me is that shared device, which is what got me into Chromebooks in the first place. That proposition - a stateless, cheap little computer that will do a lot of things very well is not advanced by these devices - the extras like the stylus and flipping won't match the extra cost, and the idea of downloading all my Android apps every time I login is daft. Great little computers. I'll be more excited by the next generation of low end ones that steal some of this hardware at a class-set price point. I'm not putting this out on the Star Classroom blog where I tend to write these days as the opinions presented here are my own and not necessarily those of my employer. 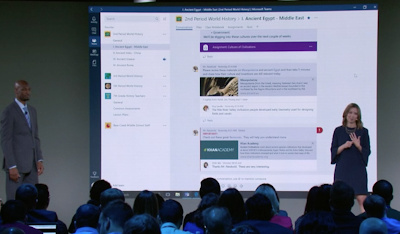 There are so many things arising from the Windows 10S presentation this week from Microsoft. Inevitably, as I'll be critical of some things that I think they might do differently, this might come over as being negative - but that is absolutely not my intention: I think it demonstrated a really positive, visionary and serious commitment to education and advancing education using technology. Microsoft are no longer the big influence on education they once were, although we still use a lot of their products, but at the current rate of innovation they are catching up with the competition. Within the flow of news though there were some parts and some claims that I'd like to explore a little. I've been an advocate for Chromebooks for some time. They are simple to manage, cheap and boot up in seconds - but that has never been the most important thing (I'd struggle to recommend something that was easy to manage, cost very little and was really fast if it was otherwise useless!) - it has been the way they deliver G-Suite and in particular Google Drive in a simple package. Is Windows 10S and the new hardware a serious competitor? Windows 10S seems to be a number of things. It is a way for Microsoft to sell something cheaper to manufacturers so that they can compete on price with Chromebooks better without sacrificing the price of Windows for other markets. In truth I think that's most of the story, but it is a good story and it means cheaper computers for schools, so hurrah. It makes Windows PCs boot up faster - sometimes much faster - to negate an advantage their competition holds. But the times they showed in the film aren't close to their competitors... well anyone who uses a Chromebook or an iPad will struggle to get excited. Mind you Apple are working on slowing iPads down as they introduce shared accounts, and Google are adding Android Apps which will slow boot ups - so maybe in a year it will be even. Is It a Cloud OS? Microsoft have got a wonderful cloud platform - Office 365. We use it on Chromebooks and every other kind of computer we own. Great. But Windows 10S has nothing specifically "cloudy" - it doesn't even default to OneDrive for storage. I would have liked it much more if when you opened a computer with Windows 10S you logged in with your Office 365 account and the storage you see for your files is OneDrive - it might use tricks to keep an invisible copy cached locally so you can work offline like Google let you do, but the user should never be encouraged to keep stuff anywhere else... They won't have a C: drive, My Documents will be their OneDrive. I think this would have been a simple way to differentiate 10S from vanilla Windows and have made a lot of sense. The way you set up and manage Windows 10S though looks to be a much more radical departure: It uses InTune to set up devices rather than traditional tools for Windows like Active Directory and SCCM. This is interesting and confusing. We're managing these PCs like any other mobile device rather than a traditional Windows computer. Personally I think this is a great idea but one that could take a long time to take hold. I can't see any of the people I know that earn a living setting up and managing Windows PCs being any more keen on using InTune instead of the tools they know and use than they are in using tools for Chromebooks or iPads. Worse, you seem to have to use a USB drive to set up a new PC. The example given was a team of staff with 30 USB pen drives setting up 1000 PCs in a day. Impressive. Chromebook - open it, plug it in, hold down CTRL-ALT and press E. Login. Job done - your Chromebook will take all your settings from the web. Windows 10S - open it, plug it in, insert USB drive, power it up. OK you don't need WiFi/ internet but am I really about to go to the shops to buy bags of USB pen drives, just as we've started eliminating them from our schools? Apple - do a mass of complex things that take too long to learn with an MDM you paid for - open the device and it is already magically set up. The Google way is marginally better for the person looking after the computer and is much cheaper. That isn't the be all and end all of IT obviously - better something good that is hard to set up than something awful that is easily managed. Microsoft are leading IT people into a new world of how to set up and manage devices, and if you accept that I would not be enthusiastic to start buying bags of pen drives for setting up PCs! I don't think it is a rash prediction to say that either a lot of schools will end up paying the upgrade fee to put normal Windows on these PCs, or hacks will be found. I use Google Classroom and Google Drive, so the next part is very subjective. I thought Microsoft Classroom was going in the right direction. They had an offer for their customers that brought together a group (set up from your management system) with a OneNote notebook, a shared library of files, a calendar and a few other bits and bobs. 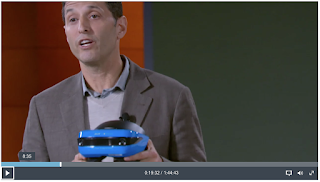 Each tool was in reality something made elsewhere in Microsoft and brought together. This did mean that if you followed a link away from a Microsoft Classroom you actually had left it - and that made it feel clunky to me. It also looks like it was made with Sharepoint. Well it was made with Sharepoint. Not good. It was what a lot of people wanted and it was close to being a released product. But it is not going to carry on past July. Instead we have a new product that looks great, based on Microsoft Teams, their Slack competitor. Teams for Education. Front and centre is the feed of discussion in the Team - the class. Around that we have a calendar, files, OneNote. Very much the same things that Classroom had. Great. It looks better too - much much better. I do wonder why 365 Video doesn't feature in it (or indeed in anything Microsoft make except Yammer... which Microsoft didn't actually make). But, it is built on a model of a group stream of comments and discussion around learning. Online. I would use it and a lot of the people I work with would too. There are however many people who do not want to have an online discussion space - they want a timeline with tasks, announcements and files and no social element at all. Many of their reasons for that are entirely sensible. When we do training for Google Classroom, one thing we show early on is the course designers control over the level of social interaction within a course ranging from all able to post and comment, to only the teacher being able to do so. People like the fact that they can set that. But if the backbone of your offering for the classroom is a social product (Teams) if you did switch it off what will there be left? Will it be a stream of one person posting messages and no comments? I really hope that there is an option to limit interaction in Microsoft Teams for Education, and when you choose to, that the resulting classroom operates and feels like a place you want to be. One of my favourite podcasts, Out of School, focused on a newly emerged problem with managed Apple ID and iTunesU. Fraser Speirs explains it in his blog in far better depth than I can but essentially what on face value sounds like a sensible idea ("only allow students with managed IDs to sign up for iTunes U at the same institution they belong to") completely torpedoes the existing practice of teachers that have their own Apple ID and a rich set of resources associated with that - and frankly don't want a second device just to use iTunes U through a restricted school ID. So you can wait for Apple, change your plans and not use Managed Apple IDs for your school (accepting that if this is Apple's strategy you will progressively be giving up things over the years ahead) or drop iTunesU and move to Google Classroom (good luck announcing that at the first staff meeting of the year!). Which rolls back to my general distrust of allowing anyone to have an undue influence on how you manage the online identity of your staff and students. If the future is moving to using an array of smaller, more focused apps rather than monolithic big institutional systems (and it is) then having your system beholden to unexpected policy changes of a third party is never going to be good news and you need to be careful where you place your trust. Solved the multi-user tablet problem (except it didn't for the very devices that Samsung had just released with great fanfare at that very show - happily we never invested money in them but we did waste several days with loan units). Solved content delivery by marrying up Google ID to a managed store for Apps and Content. 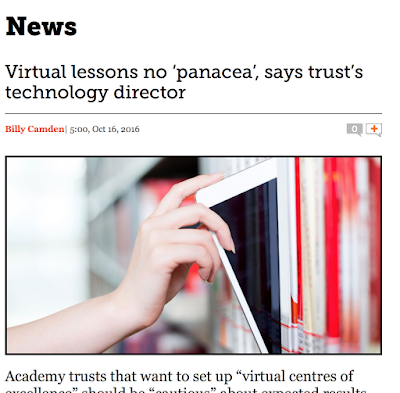 Except content was minimal (the eBook section in particular being monumentally embarrassing) and the service was.... pulled in mid-term (never, ever a sign of a committed partner to schools). With this sort of churn in mind, although I'd happily recommend using systems like Office 365 or Google Apps (or both) I would never want my organisation's strategy for knowing who is who and who can do what to be tied to Google or Microsoft or indeed Apple. We're making much greater use of iOS this year. We've held back historically partly because of the poor experience as a shared device, but where there is a 1:1 situation (e.g. as a teacher device) it answers so many questions so well, it's become the solution our staff want to use - but we're not looking at managed Apple IDs (thank goodness), rather device assigned apps and have avoided iTunesU because we just don't deploy enough iOS stuff to make it effective (and so many of our users access material on their own devices which isn't iTunesU friendly). For us Google Classroom offers a good solution because it works on everything and because our own in-house ID system syncs with Google ID. That means we aren't worried by the Managed Apple ID disaster/ fiasco (or indeed simply blip as hopefully it will be solved quickly by people at Apple who listen to Out of School). Ian Addison blogged recently about the pain of setting up multiple accounts on multiple services for his school. His school are really fortunate to have an Ian - around the world there are many hardworking souls who cope with all this logging in and authentication business for classes and their colleagues. Remember the National Grid for Learning? Wouldn't it have been great if as an outcome of all that we'd had a trustworthy single sign on system for staff and students in education that became the standard against which everyone had to do single sign on if they wanted to actually sell products in education. It won't happen, there are too many people whose business model runs counter to it... but it's a thought.